Not too much news today. Brown University published a poll about RI, the first one since February. Kerry is still miles ahead there, as expected. To keep everyone from being bored, I wrote a bit of material about the polling process. I also updated the format of the Excel spreadsheet. 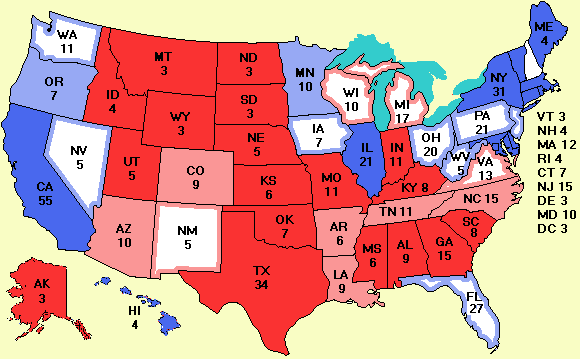 The state names now code information: blue if Kerry is ahead by 5% or more, red if Bush is ahead by 5% or more, white if they are within 5% of each other. I considered using six colors, three shades of blue and three shades of red, but Excel's conditional formatting can't handle that. Besides it might be a tad confusing. And the cartoon has been updated. If you like this website, please link to it to improve its Google PageRank and tell your friends about it.